We have arrived in Frankfurt and after a long wait to get out of the airport began the adventure of transporting ourselves and 2 bikes in boxes to our hotel. We started off with the advantage of a trolley but that didn’t last long. Found out that despite our belief that Germany is up to date with everything, they aren’t. You cannot purchase train ticket with credit card and, to make it worse, you have to have the correct change. Anyway Ian solved that problem somehow! Our skills at each carrying 2 panniers, a musical instrument (ukulele and trumpet) and a large rectangular box down escalators and on and off trains developed quickly. We had a brief ride in First Class by accident but didn’t get into trouble! But the trouble began when we decided to go to a different station from the one intended as trains run there less frequently. This resulted in a 1km approx walk of increasing agony with luggage as described above, instead of a 50m walk – which was part of the original plan – aaaarrrrgggghhh! Not doing that again. We are in Offenbach, not far from the centre of Frankfurt, an area of Polish and Turkish residents as indicated by the businesses nearby. Our hotel is interesting with lots of art work, a parlour and a courtyard. As we struggled to get the door open we met 2 other guests who look like the hairy bikers except probably not interested in cooking. 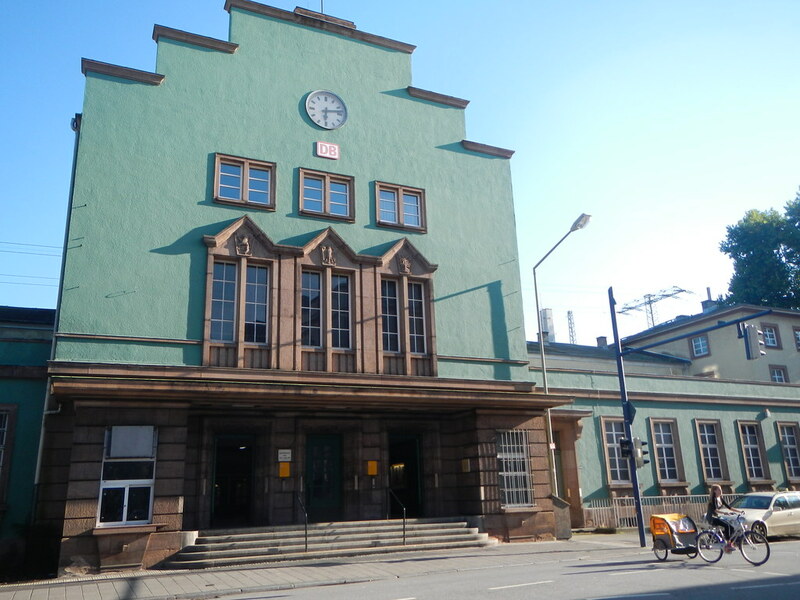 Offenbach Hbf – where we should have caught the train! This entry was posted on 19 August 2014 at 4:59 am and is filed under Europe 2014. You can follow any responses to this entry through the RSS 2.0 feed. You can leave a response, or trackback from your own site. I am sorry to hear you will be carrying your bikes all around Europe!